If people had hollow bones to enable flight how would you design armour to protect them? A race in my novel have hollow bones to allow for flight. The character that belongs to this race is a warrior. It would be very easy to break bones simply by punching a fighter of this race. Is there anything I should focus on when designing her armour? Anything different to normal? Traditional armour is completely out. Not only would it be too heavy, it's also going to restrict agility too much. I assume that for flight these race need to be extremely flexible. Does the race actually have wings that need protecting too? Wings have a very wide surface area, and are very fragile with very few fixing points - which would make them a pain to try and protect. Maybe you could fasten a 'sheathe' of chainmail over a wing, but it probably wouldn't do much good and it would likely interfere with flight. Their wings would definitely be the most vunerable part of the body. In battle, the biggest concern will be arrows, and it takes a lot of metal to properly stop an arrow. A longbow can pierce even a solid breastplate, so whatever the flying creatures are wearing isn't going to do much good. Instead, I would consider alternative types of protection; cloth armour. Wear robes instead of plate armour. Rather that trying to protect certain areas, maybe try to obscure them. I'm imagining large billows of silk cloth, in which the shape of body can hide. Make it more awkward for any attacker to take aim. If the cloth billows enough, it might even knock an arrow off-course before it pierces flesh. Wearing long cloaks when flying above an enemy is going to have an intimidating effect too; it'll make yourself seem larger and more threatening. Layers of billowing cloth would be the way to go. Make it as light as possible - silk, if possible. Wear it as cloak and hood, and attach sheets to trail from the wings. If the cloth is very fluffy, it's going to work to disrupt any attacker. To hinder them, rather than stop. Make sure that the cloth is easily detachable too, so you can drop it to entangle your opponent, without risking it entangling you. Underneath the cloth, wear very slim hard leather bandings and a helm to protect the really important stuff; organs and face. It's not going to 'stop' much, and the flyers will still be more vunerable to any impact, but it will help in other ways. This race is no match for any other race on the ground. Their "infrastructure" simply won't allow them to wear the armor the other guy can wear. This is no different than an airplane, which is the proverbial sitting duck when caught on the ground. This means your fighter must master combat in the air — and as we all know, air superiority is often the deciding factor in a war. So, let's think about airplanes for a moment. Thin skin. Originally paper or a light fabric. Bullets could go right through it. Light skeleton. Originally light wood. Flexible, but driving a car down a runway disabled every plane it touched. Note that modern jet fighters are more durable (the benefit of a much higher thrust-to-weight ratio), but a crazed jihadist driving a truck could still disable a lot of them before the truck was too banged up to disable more. Sleek. Since the air is where they've gotta be, they need to reduce anything that keeps them out of the air. Low weight. Sleek skins. Flexibility. Etc. Anything that degrades flight performance is out. So, what can we do about this? We need to preserve flexibility for flight, try to protect critical components (like the heart), and still leave some weight-carrying capacity available for things like the proverbial flower pot (we all know how deadly flower pots can be). Most of the wings need no protection. An arrow through the feathers, or even the skin holding the feathers, really isn't that critical. It's the bones along the leading edge that need some help. I want you to think about the laquered bamboo armor of the Japanese Samurai. Layered strips of laquered bamboo that would shunt aside all but perfectly aimed arrows and stones. Remember, throwing missles into the air isn't as simple as it sounds. It doesn't sound like your opposing races have access to a Phalanx CIWS. You want and only need this light but semi-rigid armor along the leading edge and exposed-to-the-ground face of the bone. Being minimalist increases risk, but it also maximizes capability. Rather than full armor, your birds will want armored patches principally protecting areas usually exposed to the ground. Forearm bracers covering the underside of the arm. Chest coverage and the forward areas of the legs' tibia and femur regions. You needn't worry so much about, e.g., the knee cap — that's a wailing good shot considering bird dude is zipping along and it's a small region. Again, we're trading risk for capability. This armor could be a stiffened leather to promote better flexibility. Your bird dudes will need all kinds of motion to control flight. Weight needs to be shifted more than for a person walking/running on the ground. Therefore, flexibility is a huge factor to worry about. I wouldn't even worry about headwear. What sword would come down on the head of your bird dudes? If they're anywhere this could happen, they're not where they're supposed to be. Flying creatures depend on the ability to get away with speed, and intelligent flying creatures would depend on ranged attacks. As you can see, if these guys get stuck on the ground their dead as door nails. But so are airplanes. The point is to keep them in the air. If you think about the flight of an arrow, it slows down as altitude increases to the point where vertical acceleration is zero. Your race would quickly develop skills for judging their altitude to minimize the risk, which is only great if they must descend for close-in combat. In that case, their friend is speed (and a lot of it). The one kind of weapon (on a bit of a side note) that they don't want is a sword or club. Absolutely nothing that requires retaining their grip as each impact would add to the force slowing them down. Sabers worked great for calvary because horses are heavy and the weight-to-impact ratio was so high that the only issue was retaining your grip. Not so with bird dudes. They'll want things they can drop in a straffing run. Short javelins come to mind. So does some form of napalm. Yeah. Napalm. "If people had hollow bones to enable flight how would you design armour to protect them?" You wouldn't, any armor at all worthy of the name "armor" will reverse any of the advantages for flight that having hollow bones gave them in the first place. If they want to fly & fight they're most likely to just rely on speed, agility & dropping stuff from a great height (well above the range of enemy projectile weapons) onto their land-bound enemies. Any armor at all reduces their ability to carry larger payloads (weapons or missiles), so they're more likely to forgo any armor in exchange for being able to carry more rocks, or whatever it is they do carry to drop on those below. If any of them do wear any armor the light stiffened cloth armor (Linothorax) used by the ancient Greeks is going to be a good starting point, probably cut down even further to cover only the most vital areas & of course ensure free movement of the wings, it's actually pretty effective. Given their preferred technique for dealing with those who can't fly is most likely dropping stuff on their heads from on high any armor they do use is probably only worn for combat with others who also fly. That also contradicts the idea that a bird-boned race would avoid fighting. Many birds are predators, others will agressively defend their nests. 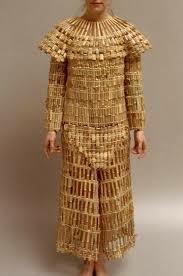 Bamboo really has been used for armor. It would be great for your flying folk. It has several advantages. 3: It can absorb impacts by breaking. 4: It can catch a sharp incoming edge within itself rather than deflecting the energy elsewhere. 5: The armor can be made modular - so pieces broken during one engagement can be swapped out for replacements. Parts of the bamboo tubing could be left open. When your flying folk dive and attack, air would whistle across it. All of them diving together would be a scary noise. If your world is free to invent things that might not exist in ours, you could say there exists a type of metal lighter than the usual ones we use, say it's specific to the avian race's home/continent and have them develop it into all manner of armour. Alternatively, if your world has magic, another option is to magically imbue regular cloth and leather armour to make it more sturdy to attacks/impacts and provide greater flexibility for flight/stealth/quick dashes in and out of a fight. One thing that definitely changes how to design armour is whether the avian race has wings and what type of wings are most common, are there perhaps multiple pairs of wings, can they be hidden. Having an opening for wings provides another weak point in ones armour and makes flanking more dangerous, but also you have to take into account how to make the openings flexible enough not to hinder flight. Not the answer you're looking for? Browse other questions tagged biology armors or ask your own question. How would metal cloth affect armor design? Could it be possible to augment the human mind and body to perform true multi-tasking? How would soldiers with indestructible bones fight? How much would unbreakable bones help with fall damage? If a human had metal bones that were completely inflexible, would this cause any ill effects?